The TentLab Moonlight 2 is a versatile and roomy tent designed to stand up to nasty weather. 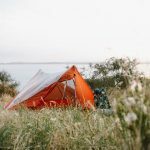 True lightweight backpackers will want to look for something more minimalist, but for the rest of us, this is a solid option for just about any adventure, especially if you often encounter serious wind and rain. With an eye-shaped pole and another straight pole, the sides of the tent up are pulled up and out creating nearly vertical walls on four sides. In testing, two of us had no problem sitting up and facing each other with at least 36 inches of headroom through a good portion of the tent. This makes the interior area feel bigger than it’s 31 square feet would suggest. Add two doors and two 11 square foot vestibules and this begins to feel almost palatial for a two person backpacking tent. Nothing ground breaking here, about 5 pounds with tent, fly, poles, stakes and guylines, and it compresses to what we’d expect in this weight range. But considering all the features in this tent, the weight becomes more of a bragging right. Plus, the polyester fly doesn’t absorb water like a more typical nylon one does—after a good soaking a nylon fly holds water inside, even if it’s not leaking through. Polyester does that too, but far, far less. This may be the easiest out-of-the bag tent set up we’ve ever had the pleasure of using. Only three poles: Two lock together to create the eye-shaped main pole and the third clips across the eye to add two more “legs”. With Jake’s Feet attachment points (ball in a socket) and color coded corners and poles, set up is easy. The tent is free standing right away. A symmetrically shaped fly keeps things simple, snapping into the corners with adjustable pulls. Setting it up solo for the first time, I easily had it ready for staking in less than five minutes. This is when one of the nicest features of this tent shines. Rarely is anchoring the tent as easy as plunging stakes into the ground. Typically tent sites are hard and rocky, and most tents come with little in the way of adjustment for stake loops. The Moonlight 2 is the exception. It has a yard of cord at each stake point, extending the range for finding a soft patch or just slinging a rock. It also has extra guy out points with cords pre-attached and nicely stored in a pocket, ready to deploy when needed. In testing, these were some of our favorite features. In our usual test of drenching the tent with a hose—doors and vents open—the interior stayed bone dry. Despite a relatively flat roof, water ran away from the doors and the tent walls. And there’s enough overhang above the doors to keep rain out as you enter and exit. Rather than nylon, which stretches when wet and requires tightening to keep things taut, TentLab went with polyester, which doesn’t stretch or absorb water. The design is also highly wind resistant. In TentLab’s own testing the banked vestibules shrugged off winds up to 37 miles per hour across the vestibules without flapping (let alone turning inside out or poles snapping). Impressive. Side winds were a little less, but still solid. We did not have a chance to test these claims. Way too many to name. 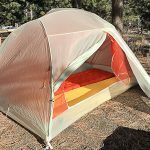 There’s so much good stuff built into this tent, including caribiner clips for drying gear, the ability to pitch it without the tent body (no footprint required), plenty of pockets, large doors, and several vents and windows. We really like the extra long guy out lines and the storage pockets for keeping the lines neat. One feature we’re not sure is necessary is extra zipper pulls inline already. I haven’t blown that many tent zips, but I guess if I do I’ll be glad to have these. The MoonLight 2 (along with it’s three and four person brethren) launched on Kickstarter with early bird pricing of $345. After the campaign the tents are expected to cost $425. For a two person tent that weighs about five pounds, it doesn’t sound that impressive. But once we started to add up all the features in this tent it began to look like a good deal. As long as you’re the kind of person to make use of all the tents features or are looking for a seriously weatherproof three season tent, this is excellent value. 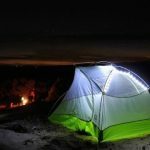 If you’re more into a tent as a place to crash out, you can save some weight and some money by looking elsewhere.